Siepi makes the “Super Super Tuscan” List! 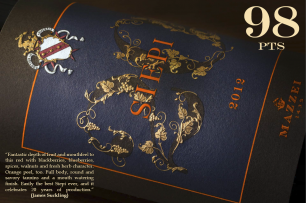 Wine journalist James Suckling has included the Castello Fonterutoli Siepi 2012 in his list of “Top 10 Super Tuscans”. The 2012 Siepi celebrates the 20th anniversary of this iconic wine. Siepi is made exclusively from grapes harvested from the eponymous Siepi vineyard, the oldest vineyard site in Chianti. Six hectares of vines are surrounded by an oak forest on the south west slope of Castellina, 260m above sea level. Siepi has a unique exposure to sunlight and ventilation, as well as a highly complex geological structure. The soil is predominantly Alberese and the average vine age is thirteen to twenty-six years old. Read the rest of James’s article here. Contact Effi to find out more about Siepi.